Moving a vehicle over unpaved roads requires a robust operating system to run the software. Linux qualifies as such, and Ubuntu is among the most popular. You only need to install QLandkarteGT on your netbook. The software together with the GPS receiver serve to display the maps, calculate routes and tracks, locate your position, and record the route. Be warned: A lengthy off-road tour preparation has to take place on your home PC. The maps and tracks prepared on it before your trip get transferred via USB memory device to the netbook or a copied to disk for the software to read from. Installing Ubuntu on a PC usually presents no problem. Distributions other than Ubuntu usually do as well. What's important is using a current version of the aforementioned software for the distribution. For QLandkarteGT, use version 1.4.0 or later; for Mkgmap, you need version r2815 or later (with the corresponding Splitter at version r311); and Merkaartor requires at least version 0.17.2. Both Mkgmap and Splitter require Java version 7. You can create cards directly from the OpenStreetMap server in a readable format (Garmin or GPX) for QLandkarteGT, although considerable computing resources are involved. For my tests, I used a computer with six CPU cores, 8GB RAM, and 21GB swap space. Even with such a powerful setup, the last successful attempt at creating a map took about three hours. My attempt at converting an OSM map of Germany with Mkgmap into Garmin format crashed at the end of three days. Later in this article, I'll show how to make the conversion a success. For now, just be aware that processing maps requires good hardware and lots of patience. If you've already decided at this point not to calculate your own maps, you won't need to install Mkgmap, Splitter, or Merkaartor. An easier way is to convert maps from OpenStreetMap to a format usable by QLandkarteGT for Garmin devices, which means that you need the programs GMapTool  and cGPSmapper . A central part of the project is the QLandkarteGT software. Although you can find it in most distribution repositories, including Ubuntu, it's usually woefully outdated. With Ubuntu, you have the advantage of integrating already compiled newer versions from PPAs in the Software Center. You can then get the current repositories for installation instead of the outdated versions. QLandkarteGT requires two additional repositories, one for the application itself and another for the GDAL library. These are both added in a terminal through the following commands. Once you've integrated both repositories as such, the software list will be at its latest state. The easiest way is through the package manager. First, load the list of programs anew and find the corresponding entries. If the software was already installed, the system will bring it to its latest version. Start QLandkarteGT after the installation and verify that it's version 1.4.0 or later. With QLandkarteGT, you can view maps on the home PC, enter waypoints, calculate routes, and create tracks from them. You can save this geodata on a USB stick and read it from the netbook later on. Working with QLandkarteGT requires Internet access, because the software accesses maps from OpenStreetMap. 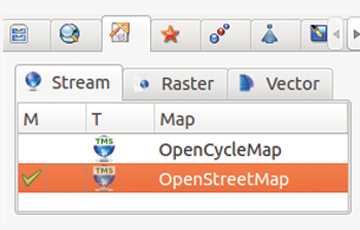 Select the OpenStreetMap server in the toolbox from the Stream subtab of the Maps tab (Figure 1). Figure 1: The OpenStreetMap server selection is in the toolbox under the Maps tab and the Stream subtab and forms the basis for the project. You can also choose Google Maps as an alternative, although OpenStreetMap is preferred in that it explicitly permits private use of maps.